The parish of Sea Palling contains the villages of Sea Palling and Waxham, and is situated on the north Norfolk coast, some 18km northwest from Great Yarmouth. This parish has a long stretch of coast, dominated by wide yellow sands and grassy dunes. Behind the dunes the land stretches flat and low, and is heavily criss-crossed by drainage channels. The name ‘palling’ is derived from the Old English words for Place of Paelli’s people. Despite being now a sparsely populated parish, Sea Palling has a large number of archaeological records, over 180 in total. The earliest recorded objects are a number of prehistoric stone or flint objects, which have been found across the parish but particularly along the beach. These include Palaeolithic handaxes (NHER 8354, NHER 17013), a Mesolithic flint knife (NHER 8368), and a number of Neolithic axeheads (NHER 8356, NHER 8386, NHER 38124). 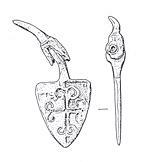 Objects from the Bronze Age are limited to a rapier (NHER 34508), recovered from a peat deposit eroded by the sea. Iron Age objects are limited to a coin (NHER 33157) and some pottery sherds (NHER 32093, NHER 42660). Due to its coastal position Sea Palling has been the subject of aerial photography for some time, and in recent years the Norfolk National Mapping Project has been analysing and identifying the features depicted on these. As a result a large number of features, particularly those that have been visible only as cropmarks, have been added to the NHER. Of these twenty-five possible prehistoric features have been identified in Sea Palling, including ditches (NHER 43655, NHER 42097), trackways (NHER 42069), and field systems and boundaries (NHER 27249, NHER 42116, NHER 42133). A number of ring ditches, possibly dating to the Bronze Age (NHER 27703, NHER 27709) have also been noted. Objects from the Roman period are not numerous, and are restricted to coins (NHER 8359, NHER 33158, NHER 40529) and pottery sherds (NHER 8360, NHER 8398). An excavation near Church Farm discovered a pit, with Roman pottery sherds in the fill, which may date to the Roman period, but this is uncertain. Equally, there is little evidence from the Saxon period, though some pottery sherds (NHER 8363, NHER 32093) have been recovered, as well as a fragment of an Early Saxon square-headed brooch (NHER 31508). Excavations near the Waxham Great Barn have also revealed a burial which may date to the Late Saxon period, as well as a pit, stake hole, and cess pit which may also date to this period. Interestingly, Waxham and Sea Palling are both mentioned in the Domesday Book, but although both appear to be valuable lands, it is Waxham that appears larger and more populous. There is also mention of a church in Waxham, though this is likely to refer to the church associated with the medieval village of Waxham Parva, which has been lost to the sea. The remaining church of St John (NHER 8372), built very close to the Hall, dates at its earliest to the 12th century. The church itself is a small and stone building, patched in several places with brick and showing signs of the erosion that is occurring to land and buildings across this windswept coast. Just up the coast, the village of Sea Palling also retains its church, dedicated to St Margaret (NHER 8381) and luckily situated away from the sea front, which is currently protected by artificial reefs and a volunteer lifeboat service. This earliest parts of this church date to the 13th century, and is has been comprehensively restored and saved from decrepitude in the late 19th and early 20th centuries. Inside there are a number of lifeboat boards, detailing the boats and rescues between 1860 and 1929, and a small memorial to those villagers who lost their lives in the disastrous floods of 1953. Aerial photography has captured a number of features that, due to the constant coastal erosion, may now have been destroyed. These include the remains of medieval trackways and structures situated in the inter-tidal zone (NHER 27301, NHER 27302, NHER 27312). A small number of medieval to post medieval enclosures and field systems have also been identified (NHER 27725, NHER 36133, NHER 42112), and there is also evidence that peat cutting or clay extraction took place on a small scale during the medieval period (NHER 42127, NHER 43428). However, the most exciting feature from the late medieval to early post medieval period is Waxham Hall and Great Barn (NHER 8365). This 12th century manor had descended to the Calthorpe family by the 16th century, and then passed to the Wodehouses, who built the present Hall and enclosure some time before 1571. The site was surrounded by a high wall, the most northerly section of which survives today, ringed by the track to the coast and standing incongruously close to the encroaching dunes. Gateways in this wall allowed approached to the church and house, and one 16th century example still survives. An interesting feature can be seen on the wall that defines the private garden area inside, where a 19th century craftsman has created relief figures in an Aztec style. The Hall itself was originally built at the same time, around 1570, but has been subject to extensive alterations since. Although a blocked 16th century entrance survives, very little original detail remains. However, the gigantic Great Barn, the largest in Norfolk and probably built to compete with the rival Paston family further up the coast, is almost complete. It is a giant at some 55 metres long, and following a compulsory purchase order by Norfolk County Council, has been restored to glory and is open to the public. It should also be noted that Waxham is known to be the location of one of the earliest duck decoys in the country, established in the reign of James I (1603-25). Lambridge Covert (NHER 13293) is a possible site for this, as well as an area of Waxham marsh (NHER 42091). A number of windmills survive in this area, including both those designed to grind corn (NHER 8371), as well as those intended to act as pumps and protect this low-lying coast from flooding. Of the later, Lambridge Mill (NHER 8374) has surviving internal machinery and fragments of sail, and three-storey Brograve Mill (NHER 8389) is said to retain some machinery. Post medieval drainage ditches can also be seen across the parish, some of which have fallen into disuse and are visible as cropmarks (NHER 39022, NHER 42109, NHER 42150). Also visible on aerial photographs are the marks left by the digging of drainage ditches around post medieval haystacks (NHER 27711, NHER 42071, NHER 42149). Also of note are a small number of post medieval buildings, some of which have been listed by English Heritage. This includes French’s Farm House (NHER 30681), an early 17th century brick and flint house incorporated some reused medieval stone, and Brograve Farmhouse (NHER 46634), a thatched house with a brick façade dated to 1762. A few objects from the medieval and post medieval periods have been recovered from Sea Palling, including pottery sherds (NHER 8355, NHER 8398, NHER 35104) and a few coins (NHER 8360, NHER 24406). Metal detecting on the beach has added an unusual medieval lead pilgrim bottle (NHER 31049) and a horse harness pendant (NHER 35002). From the more recent past, this parish has an impressive number of World War Two features, many of which survive today. Due to the wide, pleasantly sloping beaches and proximity to France, this area was one of those earmarked as particularly at risk from invasion. As a result, a large number of pillboxes were constructed, twelve of which have been recorded. Six of those are thought to still be present, and they can be seen in the dunes all along this stretch of coast, although some have become partially or completely submerged in sand (NHER 32641, NHER 32642). A rare World War One pillbox (NHER 32645) is also thought to survive on the north side of the B1159. A large number of other military structures have also been identified from aerial photography from the World War Two period. These include searchlight batteries (NHER 34548), anti-tank cubes (NHER 27295), gun emplacements (NHER 27300, NHER 27304, NHER 42126), bomb craters (NHER 42072, NHER 43384), and the site of a RAF wireless station (NHER 43383). The later is thought to have consisted of two timber masts, blast walls, a transmitter block and plinth. As there is no nearby airfield, it is likely to have been used to communicate with homecoming aircraft or to detect enemy code. Also noted is some beach scaffolding (NHER 42105), which survives in places and originally occupied a continuous line along the whole length of this parish. It should be noted that some of this barbed wire and scaffolding may also remain buried beneath the current beach level. Ruth Fillery-Travis (NLA), 5 April 2007.